Social entrepreneur, philanthropic consultant, author, journalist, and political organizer, Billy Wimsatt’s latest book is Please Don’t Bomb the Suburbs: A Midterm Report on My Generation, and the Future of our Super Movement (Akashic Books, September 2010). 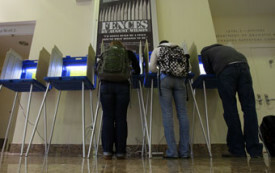 National exit polls of more than 17,000 voters show a remarkable trend: adults age 18–29 voted against the Republican Tsunami by sixteen points (56–40). Younger adults age 18–24 were even more progressive, voting against Republicans by nineteen points (58-39).